I went back to this scene today to try again with my EV at -3 and it was better..
1. Laughter - friends with the same sense of humour! 2. Lounging on a comfy couch in a bar built over the water, with a martini - for me, not the bar. That's where a comma makes the sense. 3. The name of a property we passed in the car - 'Forest Waters". @stray_shooter ....this was the second attempt! Worth going back for a second look - what a great scene and you have captured the sheer power of the water falling down. Love this, very well done. Lovely smooth water Maggie! Beautiful light, it looks quite summery still! Love the little rainbowI colour at the bottom of the waterfall. I like the lounging weird, I'm partial to a bit if lounging myself these days! Lovely, and I like your 3 things a lot! Beautiful, when I locate my tripod I want to try this!! The small flow on the left is really nice!! @hrs This area has numerous waterfalls, Helen - all worthy of a photograph! @happypat The blues seem to come out quite obviously when using a slow exposure on water, Pat! Lounge away - the word really does not mean getting up all the time! Forget the ND filter - you've got this down now! All the way to PP and TP! Congrats! @stray_shooter this worked at this distance but not closer! Still need that ND filter! In my part of the world - Paihia! Are you coming here or have you already been? Such a lovely scene. I do like a waterfall. @alinz Oh really? Didn't realise that. We lounged in the comfy seats of the 'Alongside' bar and cafe and had a martini and coffee the other day. But now in Tauranga Bay. Lovely blue tones in the falls. Congratulations for hitting the PP with this photo. You can rest on your laurels now you have achieved silky water!! This is such a beautiful scene; the silky water is very nicely done. @maggiemae we just moved 6 weeks ago. let me know if you visit again! 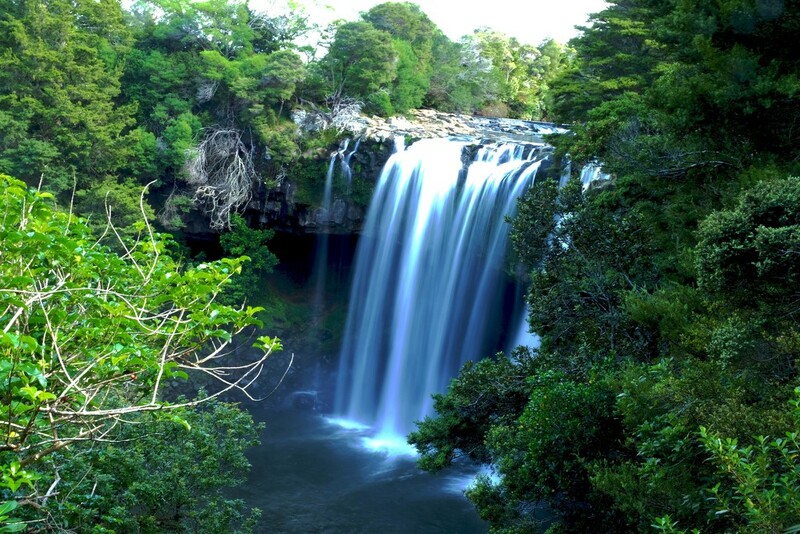 Are these the falls at Waipapa? If so, it is possible (for my kids anyway) to get in behind the falls themselves. I would love to do it, but I think it is tricky and very slippery. Would make such an awesome photo though. @maggiemae Haha I have to agree with you Maggie, but would love to do it! !